I subscribe to a couple of blogs. One of these sent me a New Year—New Beginnings themed blog a couple of days ago and invited to reflect on how I had used the first few days of the new year and if my actions were setting me up for a good 2013. The first week of 2013 was spent in Greece and I think it was a great place for to spend the first few days for a couple of reasons. The first and most obvious is that I can’t really think of a better way to spend New Year than on a dream holiday (note: not “trip of a lifetime”, because I intend to have many more!!) 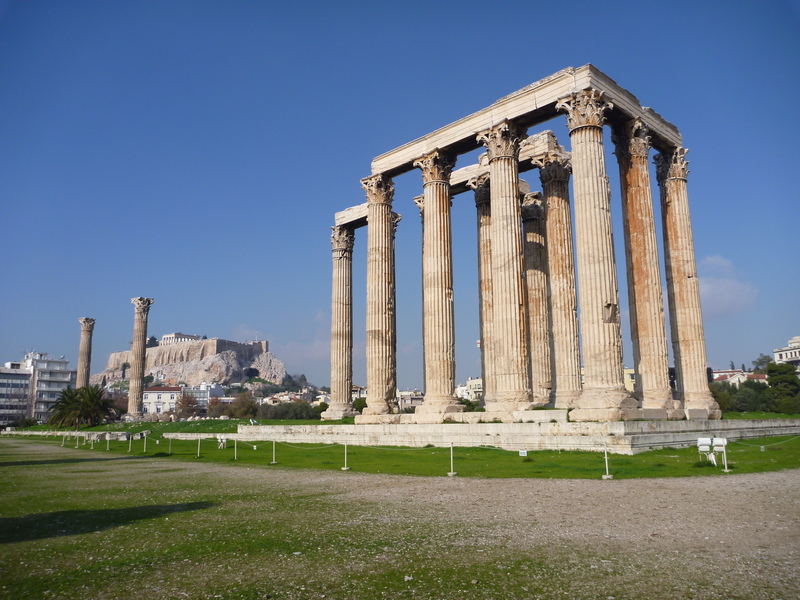 On 31st December we spent the day exploring the Roman Agora and the Acropolis. We stayed in Athens with an old friend, Gregory, (whom I met on a Japanese youth program Ship for World Youth or SWY in 2010). For New Year’s Eve, his family kindly hosted us at their home for a big family dinner – starting at the way-too-trendy time of 10:00pm. So as the New Year ticked over, we were; overseas, catching up with old friends, and on the receiving end of some incredibly generous hospitality which included gorgeous food and beautiful wines – big tick for doing New Year right I think! From there we returned to Gregory’s to continue the evening (or morning) with cards, cheese, and much more wine! The second reason, that I think Greece was an apt place to spend the New Year, and a slightly more philosophical one is to do with new beginnings. When the topic of the crisis came up, almost all of my Greek friends talked about moving forward, the need to keep moving forward with positive energy where possible and saw 2013 as a time for new beginnings. As far as signs of the crisis goes – it is hard to say whether you only notice things because you are looking for them or if you would have noticed something askance if you didn’t know how the country is suffering. There was certainly a noticeable amount of graffiti (particularly politically motivated) around Athens, and more homeless people and beggars than I have seen in a major city. I think the most telling thing is that almost all of my Greek friends, who are incredibly dynamic, well educated, and community minded young people are either unable to find work or have moved overseas for short or long term to find work. From Athens, we caught the bus up to Kalambaka. This area is better known under the umbrella of Meteora. Meteora is very impressive with sheer rock towers looming over the villages of Kalambaka and Kastraki. The Meteora are currently home to half a dozen monasteries but once housed 27, with a monastery perched atop each of the cliff tops in the area. (If you are not familiar with Meteora, I strongly recommend a google or quick visit to Wikipedia – it is very hard to describe how magnificent this area is!). We avoided minor disasters here (not of the climbing variety) on a couple of occasions. In the first instance we arrived at the Hotel Meteora (which we had booked online) – a clean but fairly daggy little B&B that was, when we arrived staffed only by a grandma of about 80 and two small children. After heading out for some dinner we returned to the hotel to find a fairly irate lady who was adamant that we didn’t have a booking (and didn’t seem interested in charming us to stay despite the very quiet tourist season) and was very confused as to how we had obtained a key. We eventually established that there was another Hotel Meteora in the much smaller village of Kastraki and her, much friendlier, husband kindly offered to take us there. Our stress levels were pretty high at this stage, and I had no small amount of nerves about staying at a similar establishment in a place that might not even have eateries or similar in the area. This brings us to the second near-fail – upon visiting the tourist office before dinner we had been advised that the only way to visit the Meteora and the monasteries was to catch a taxi up. They also advised that we probably wouldn’t be able to find taxis up there so that we should arrange, with our nonexistent Greek, to have the taxi wait for us ie. hire them for the day. Our arrival in Kastraki quickly put aside the fear that our best laid plans were going to pot. The Hotel Meteora in Kastraki was a far cry from its Kalambaka name sake. It was a beautiful 5 star hotel with incredible views of the Meteora and gorgeous big balconied rooms. While we were waiting to check in our lovely driver also informed us that ‘yes, you can climb the Meteora,’ ‘No problem at all’ and proceeded to direct us as to the best walking paths on our map. 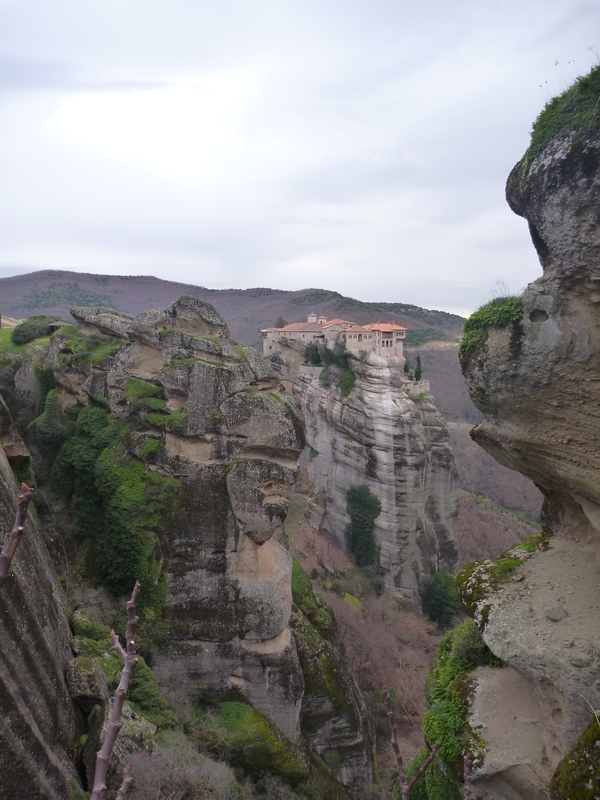 The next day was the highlight of our time in Greece, we spent an amazing six hours walking around the Meteora, admiring its incredible views and marvelling at the beautiful monasteries. Having a very nice hotel room to return to, we decided to spend the evening at home relaxing with another wine & cheese picnic while we watched For Your Eyes Only (in order to see the places we had just visited!). From here we travelled to Thessaloniki to catch up with more SWY friends – Maria & Konstantinos. Maria’s family graciously hosted us in their home. Ryan felt the full extent of Greek hospitality when we attended a family lunch. Nothing makes a Greek mother happier than having a young man to feed, they told us as one of the four mothers at the table piled his plate up for the third time. By the end of the meal Ryan was hunched forward with his arms crossed over his plate and refused to turn sideways to talk to anyone for fear that another monster serving would be slipped onto his plate while his attention was diverted. Apart from the enjoyment of being able to catch up with old friends, Thessaloniki was also very special for me as my great-grandfather, is buried in the Allied Military Cemetery, having died in Salonika in 1917 while serving with the British Army. I was very, very touched to have the opportunity to visit. I will certainly be heading back to Greece in warmer weather to experience their famous island culture and more of their beautiful food & lovely people! This entry was posted in Matryoshka, White Christmas and Reindeer Burgers, Travel and tagged Greece, Meteora. Bookmark the permalink.